Following the 7 December 1941 attack on Pearl Harbor, President Franklin D. Roosevelt ordered the Army Air Forces to mount retaliatory raids on the Japanese home islands. A task force, commanded by Colonel Harry E. Halverson and composed of 231 officers and enlisted men and 23 B-24D Liberator bombers, was assembled at Fort Myers, Florida. The unit was given the code name "HALPRO" for Halverson Project. This organization, destined to be the parent unit of the 376th Bombardment Group, departed the United States on 20 May 1942 to begin attacks on Japanese targets from a base located in China. When HALPRO arrived in the Middle East, the unit learned that its' proposed base had been captured by Japanese forces. To make matters worse, the German Afrika Korps under General Erwin Rommel was poised to attack Allied forces in North Africa. HALPRO was quickly diverted from its' original mission to a new one: interdictory raids from airfields in Egypt against shipping and North African ports supporting Axis operations. On 20 June 1942, the Halverson Project was dissolved and the organization was renamed the First Provisional Bombardment Group. In subsequent organizational change, all First Provisional personnel and B-24s were transferred to the newly activated 376th Heavy Bombardment Group. 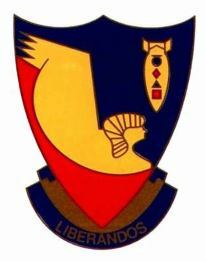 The order became effective on 31 October 1942 and as a subsequent gesture of unit identity, members of the 376th adopted the nickname "Liberandos". Rapid build-up of personnel and aircraft in early 1943 resulted in the formation of a fully formed group composed of the 512th, 513th, 514th and 515th Squadrons. Attacks by the fledgling 376th, the first heavy bombardment group to operate in the Middle East Theater, were focused on Axis supply lines between Italy and North Africa, airfields, and port facilities. Later, longer range raids were made against oil refineries, marshalling yards, and ordinance factories in Hungary, Austria, Czechoslovakia and Yugoslavia. The Liberandos were also chosen to lead four other B-24 bombardment groups on the daring 1 August 1943 low level raid against Romania's Ploesti Oil Fields. After the liberation of North Africa late in 1943, the Group moved to San Pancrazio, Italy where it participated in an accelerated campaign against Axis targets in southern Europe and the Balkans. Group sorties extended as far as Vienna, Austria and Regensburg, Germany. During four years of operations, the 376th and its parent units became integral elements of the 9th, 12th, and 15th Air Forces. The Group flew 451 missions, was awarded three Distinguished Unit Citations and earned 15 campaign awards. The Liberandos destroyed 220 enemy aircraft in aerial combat and suffered casualties totalling 1479 officers and enlisted personnel and 169 aircraft.